WSU President’s Associates Gayle and Alan Weiss are taking the lead to help students in the School of Hospitality Business Management (SHBM) become well-informed and knowledgeable in the proper and safe handling of foods for special needs guests. Their annual gifts to WSU support Food Allergy Safe Certification training offered to SHBM majors. 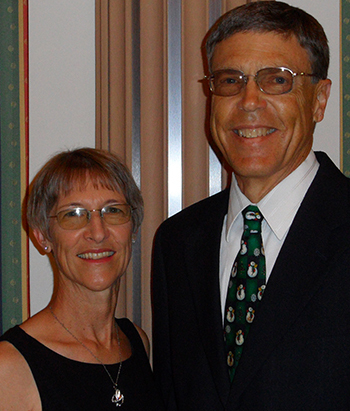 Gayle (’74) and Alan know firsthand the risks and dangers of food allergies, food intolerances, and food sensitivities. Fifteen years ago, Gayle and her brother-in-law (Alan’s brother) were diagnosed with Celiac Disease (gluten intolerance) along with other food sensitivities. Having to eat a strict gluten-free diet for life—no wheat, rye, barley, or contaminated oats—changed their lives dramatically. “With Celiac Disease, a gluten-free diet is medically required, not a ‘desired’ diet,” Gayle says. The ability to interact socially and to travel and eat out safely outside their own home is very difficult and often impossible because of the lack of food allergy awareness, availability of gluten-free food, and cross-contamination issues, she says. The couple’s gifts are filling a niche with a life-saving impact. “There is a great and growing need for more awareness in restaurants, hospitals, assisted living facilities, cruise ships, and in any business where food is prepared and sold,” Gayle and Alan say. Their concerns led to discussions with Nancy Swanger, director of WSU’s top-ranked SHBM program. They envisioned a comprehensive course that educated and enlightened future professionals in the hospitality industry. After exploring the available options, Gayle and Alan decided to fund the Allergy Safe Certification training offered by Spot Check, a Seattle-based company. Their annual gifts cover costs associated with the training and subsequent certification exams. Additionally, the couple’s support will extend beyond their lifetimes thanks to their ultimate gift to WSU: the Alan and Gayle Weiss Endowment for the School of Hospitality Business Management. The endowment will be funded in the future through the couple’s estate. how to operationalize food handling measures to serve all customers in a safe manner. Jim Harbour, Culinary Educator, oversees the training. Course work takes place in several classes taught as part of SHBM 358 (“Foodservice Systems and Control”). The certification exam is administered online by Spot Check. About 120 students take the exam each year, says Harbour. WSU School of Hospitality Business Management senior Sarah Beaudry (’16) is certified in Food Allergy Safe training, a valuable (and life-saving) skill among today’s culinary professionals. Spot Check developed the Allergy Safe Certification and training program to align with Public Law 108-282, better known as the Food Allergen Labeling and Consumer Protection Act of 2004. The company’s program is recommended for front and back of the house personnel who work in restaurants, quick service, elementary and secondary school cafeterias, daycares, bakeries, nursing homes, grocery store delicatessens, and other public and private food establishments. “The biggest take away (from the training) is how do we solve the issue? How do we produce safe food for those with intolerances and food allergen issues? What are the systems and procedures put into place to allow us to produce this food with confidence and to provide happy guests regardless of their dietary restrictions?” says Harbour. There is no cure for a food allergy, which can begin at any age. Up to 15 million Americans have food allergies, according to Food Allergy Research & Education (FARE), an organization formed in 2012 when the Food Allergy & Anaphylaxis Network (FAAN) merged with the Food Allergy Initiative (FAI). The new organization combines FAAN’s expertise as the most trusted source of food allergy information, programs and resources with FAI’s leadership as the world’s largest private source of funding for food allergy research. The Food Allergy Safe Certification training made a noticeable impact on SHBM Executive Chef and culinary instructor Jamie Callison. “This program changed the way that I respond to my guests’ allergies, intolerances, and overall food preferences. Information attained from taking this course, I know has saved lives,” he says. 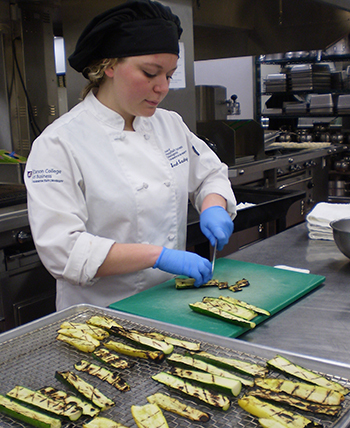 SHBM major Sarah Beaudry completed the allergen training and passed the certification exam last year. She is grateful to Gayle and Alan Weiss for helping her to become a confident and capable culinary professional. “The allergen test was very beneficial and has enhanced my awareness to safe, clean practices for working with food and in the hospitality industry. The knowledge is something I will take with me moving forward as a Hospitality Business Management student from WSU,” she says. When she graduates in May, Sarah will go to work as a Culinary Voyager at the JW Marriott Desert Ridge Resort & Spa in Phoenix, Arizona. In the future, the Alan and Gayle Weiss Endowment for the School of Hospitality Business Management will inspire SHBM students like Sarah to continue the couple’s commitment and create safer dining and travel experiences throughout the United States and the world.